102 meter respekt i titan(!). Motherland, Kiev, Ukraina. Foto: Anders Thorsell. 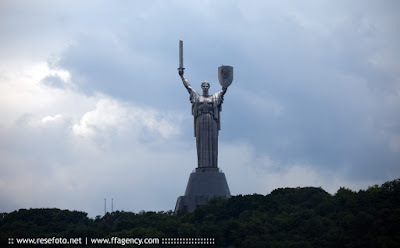 Known locally as 'Brezhnev’s Daughter' or the 'Iron Maiden' the Motherland Monument is a giant titanium statue that celebrates the Soviet Union's victory over Germany in the Great patriotic war. 102 m high and visible from various points around Kiev, it is the city’s most distinctive feature.